Today we have an interview with our lovely Marcelina! She is beautiful and such a joy to have working at Galeria Dos Sonhos. 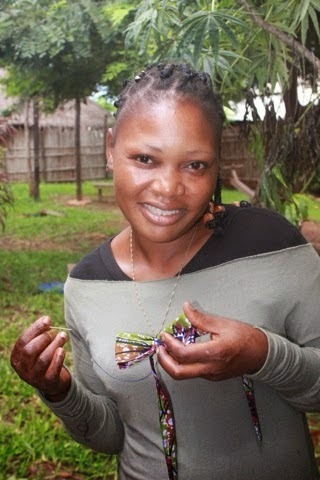 We think her story is a valuable glimpse into everyday life of Mozambicans and are happy to share with you. -I grew up about 45 minutes from Pemba with my two parents, one brother, and one sister. What was your house like? Was it safe? -I grew up in a mud house. The village I lived in didn't feel safe because there were banditos. One lady who was with my sister got attacked by banditos. Before working with Iris what did you do? -I did nothing before working here. I lived in the barracas. I have worked here for a year now and have learned how to sew. What have you learned working here? -I didn't know how to sew before coming to work here. Now I make bags and bandanas. I also make table runners. I know how to use the sewing machine and how to pattern cut. What do you like about working at Galeria Dos Sonhos? -Working here is different than what other women in the village do. Also, I know I will actually get paid working here. Now when I get paid I can buy the things I need for my children like clothes and food. The people are kind and patient here. I like working with them. How do you feel working here? -I feel the presence of God and more hope working here. I feel more honored and respected now that I come here. -I have known Jesus for two years now. It also good to get disciples and get to know God more deeply. -I used to have problems with people. I did not seem them as people, I didn't like people. Jesus has taught me that I can make friendships. I get along well with the people who work here (at Galeria Dos Sonhos) and better with the people in the village now. -I would love to own a house one day because right now I live in a room in a baraca. baraca- a small store typically made of bamboo, usually only selling a few varieties of items; beer, soda, washing powder etc. You have seen Alima in pictures and now you can hear her voice. I am so blessed to know her. Undone by how one life touches another and by the wonderful life I have been given. I am humbled by her and her generous heart.